PONANT invites you to discover the ancient Inca Empire and its stunning slumbering citadels. 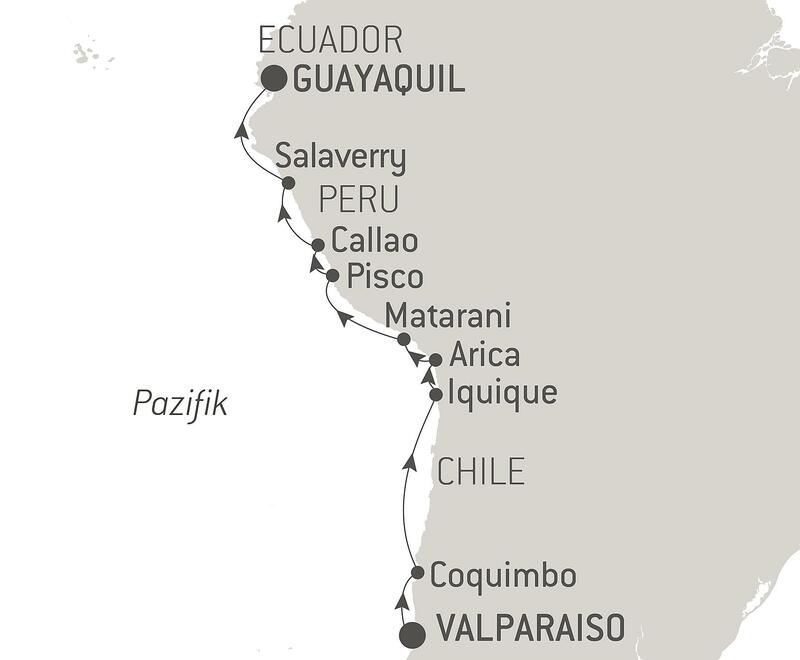 From Valparaiso, set sail aboard the Le Boréal for a 13-day cruise along the coasts of Chile and Peru. You will visit Iquique and its exceptional historic centre inherited from the Gold Rush. Not far, you will find Humberstone, a disused mining town where the buildings now house museums listed as UNESCO World Heritage Sites. Arica, the ‘city of eternal spring’ where the climate is temperate and sunny year round, is very popular for its beautiful beaches and its sites brimming with history. You will be captivated by this surprising city where the Inca people once lived. From the port of Callao near Lima, you will be able to visit the ancient city of Cusco, discovered in 1533 by the conquistadors, as well as the famous site of Machu Picchu, the gigantic lost city, an architectural gem listed as a UNESCO World Heritage Site. Le Boréal will stop at Salaverry, an opportunity to discover the ruins of Chan Chan, the largest adobe citadel of Pre-Colombian America and former capital of the Chimu kingdom. Your cruise will end in Guayaquil, after a unforgettable journey full of cultural discoveries.